I’m a very vintage-y kind of girl. I love vintage clothing, and vintage jewellry, and, most particularly, vintage hats. 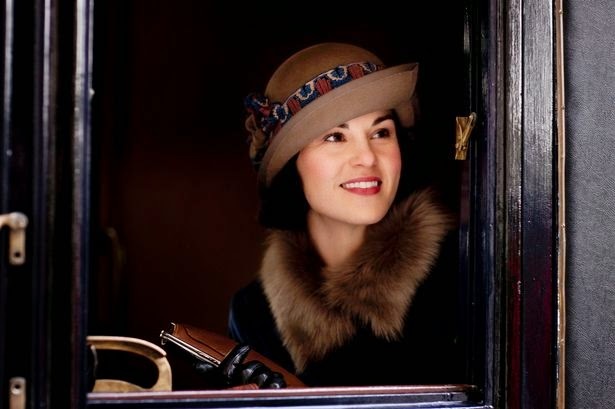 Like these on Michelle Dockery who plays Lady Mary Crawley on Downton Abbey. Doesn’t she look divine in a hat? And aren’t these hats perfection? 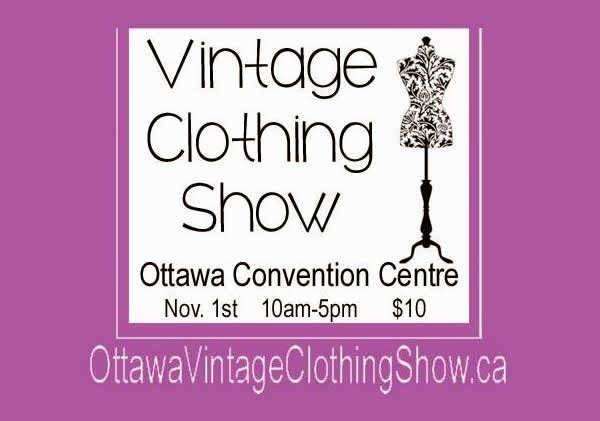 So I guess it’s not surprising that an important event on my yearly shopping calendar is the Ottawa Vintage Clothing Show held every November. Fall (my favourite time of year, for fashion, at least) and vintage … together. What could be better? The Vintage Clothing Show is more than just shopping, you know. It’s an event. You don’t go just to buy; you go to look and admire, and oooh and ahhh at the treasures on display. You go to dream about who owned this red and white dress, and what their story might be. I wouldn’t necessarily purchase these heavy suitcases for travel, although I’d love to own that black and tan one… just to look at. I wonder what tales these cases could tell of their journeys, tales of love and heartbreak and leaving and coming home again. When I taught creative writing, I used to have a stash of old buttons, and postcards, and trinkets purchased at antique stores and flea markets. The students would select a collection of three or four items and use them try to “build a life” for a fictional character. It was great fun. As you can see, in a way, I’m still doing it. So imagine: November 1, a crisp fall afternoon. Dressed in jeans, and a soft, white turtleneck sweater (recently acquired from Vince) and wrapped in a gorgeous, emerald green tweed jacket, a long emerald and teal scarf wound around my neck…with one of my favourite vintage brooches pinned onto my jacket… I set off. Sigh…. truth be told… I didn’t… set off. Sidelined by a killer sinus headache, I missed the show this year. And although I mourned the fact that I missed out on the mingling and admiring and dreaming part… I was kind of glad that I wasn’t tempted to do any shopping. I have come home with quite a number of vintage wares over the years already. More wares than I can wear, actually, if you’ll excuse the pun. 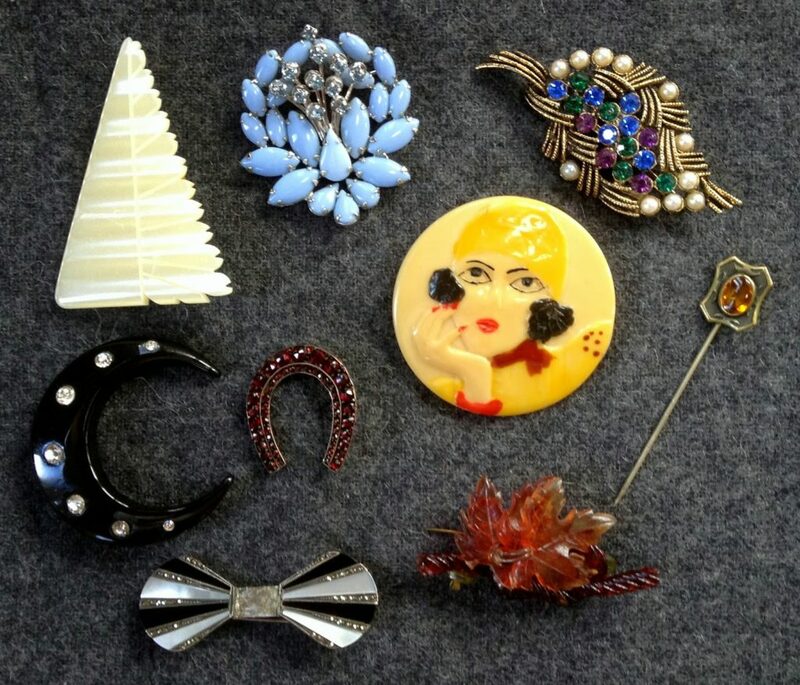 These are my vintage brooches. Well, most of them. I love the art deco triangle and the bow tie. The black moon with the rhinestones is one I wear a lot. And the baby blue brooch from the 50’s is one of my absolute favourites. Really, though, I love them all. These are some of the vintage bracelets I’ve collected over the years. The gold child’s bracelet on the left is the first vintage purchase I ever made. My wrist is very small, so it was a perfect fit. I don’t know if the cream and tortoise shell one is Bakelite or celluloid or what… but I’ve loved it for many years. But much as I love old jewellry… my passion is for vintage hats. 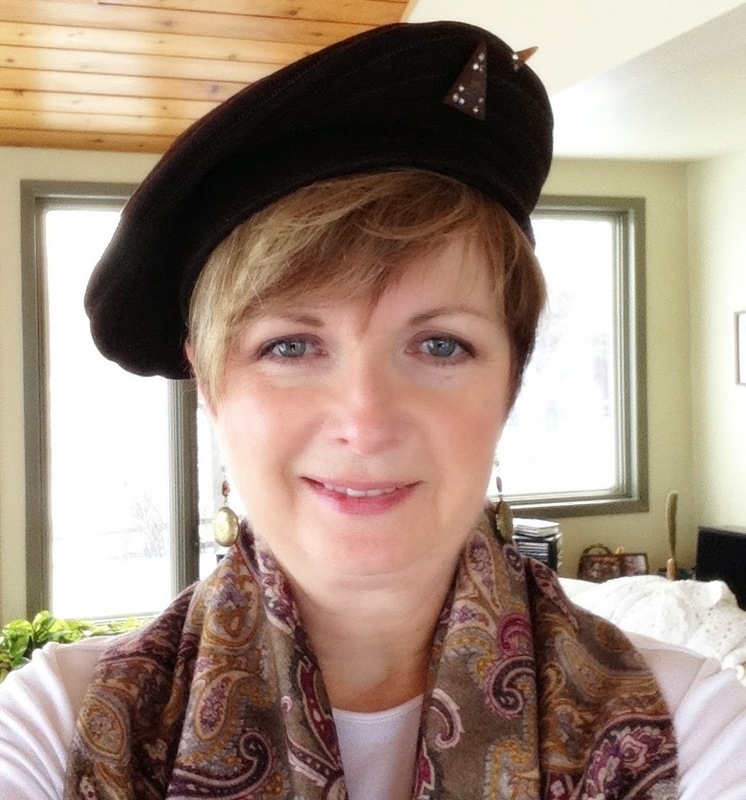 The brown beret from the 40’s is more my everyday style. I’ve worn it quite a bit. I love the Bakelite pin it came with. This hat makes me feel like I should be wearing a tweed skirt suit and sensible oxfords…and be on my way to roll bandages…or something. This burgundy stunner is my out and out best hat. How I wish I had the nerve to wear it somewhere. I bought it at an antique fair one summer. My friend and I were trying on hats at a booth, and soon, we were surrounded by a small group of elderly ladies who ooohed and ahhhhed at each hat, eventually deciding that I must buy this one. So I did. Since I was a child, I’ve always been enamored with the past. I love antiques, and old photographs and historical fiction and costume dramas, like Downton Abbey. I’m not sure why. It’s not as if I have illusions that life was better seventy or eighty or a hundred years ago. But it’s as if I have this urge to know what it was really like back then. To know what the banks of the Saint John River looked like when my mum swam there as a girl. To hear the sound of the horses on the streets of downtown Fredericton when my stepfather went to town with his father. To meet my grandmother and her sisters when they were girls, riding to the dances in Perth-Andover in their horse and buggy. According to Grammy, the fun never started until the Everett girls arrived. Hmmm… I wonder what they wore to those dances…. Okay. Enough. I have to snap out of this daydream. I’ve things to do. Outfits to plan. Like what to wear tomorrow to go from skating, to lunch with a friend, to drinks with the girls after work… without coming home to change. And if I should wear one of my very vintage-y hats. Are you a very vintage-y kind of person? Do tell. I seem to wear more hats in the summer than winter and slowly warming up to the idea of wearing hats in the fall. I love all the costumes from Downtown Abbey. Me too, Alice…definitely a Downton fan. I'll stop by TBT on Thursday. Thanks for reading. Love your post! I too like a little bit of vintage. I've been on a mission for vintage suitcases lately. I love them and plan to use them for a nightstand as well as a place to store my stationary. Come visit me sometime at http://www.lifeawayfromtheofficechair.blogspot.com. Thanks, Lisa. 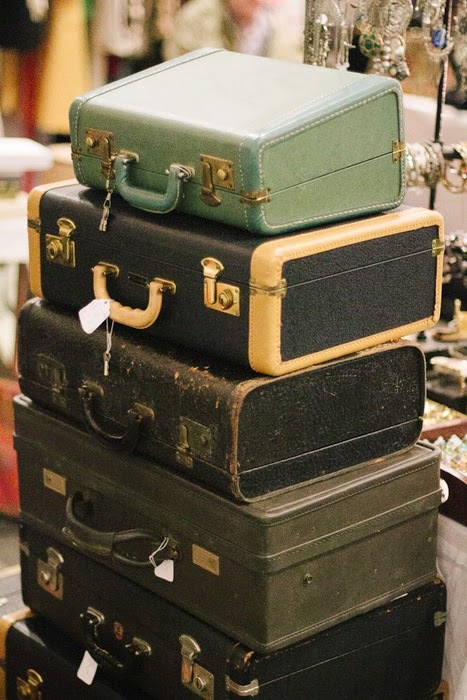 What good ideas for using vintage suitcases. Hmmm …maybe I'll come home with one from next year's show. Thanks for stopping by. You look amazing in hats! 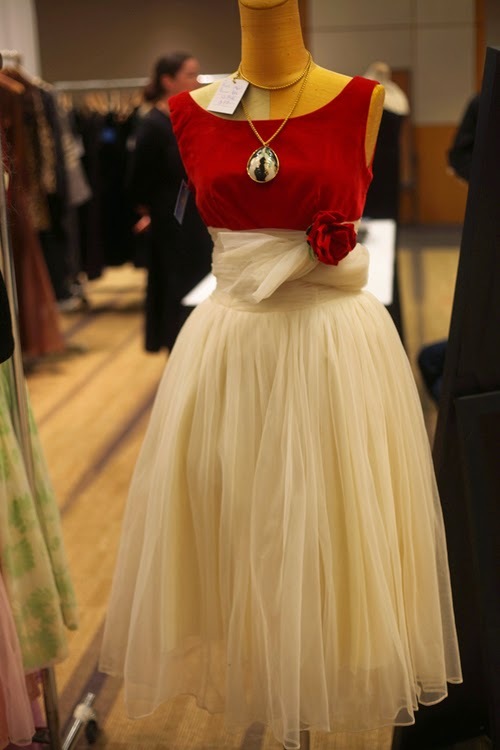 I am so jealous…I wish we had a vintage clothing show…how much fun. Thanks for sharing with the Thursday Blog Hop! Thanks Pam. And thanks for hosting the blog hop. Exactly how I feel about the past–no illusions, but a deep and affectionate curiosity. Thanks for putting it into words! Your welcome. And thanks for reading. I love this post. I am not so vintage-y but I love seeing nice styled pieces. That coat looks precious. what a great post! i've never been attracted to vintage clothing for myself but will definitely reconsider that position as regards the jewelry. those brooches can add a great touch of individuality to any outfit. i'm also with you on your love of history and historical novels. it is fascinating to me to read about the everyday lives of people at other times, in other places. i grew up in new orleans, where history tends to be a preoccupation for many people. new orleans has such a colorful past and my family has lived in the area for 200 years. I've never been to New Orleans, but we spent a few days in Savannah, Georgia last year and found it redolent with history. Loved it there. I'll bet you have a treasure trove of family stories. 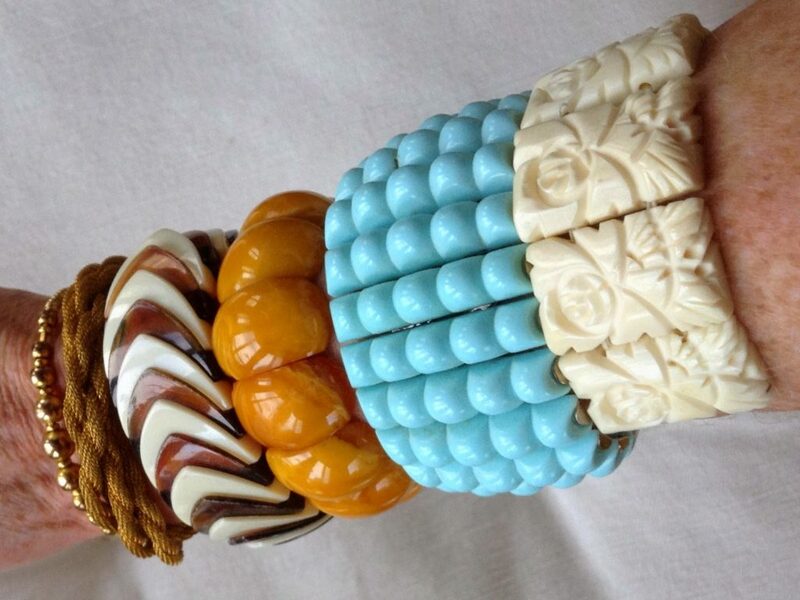 As to the vintage brooches… I love them and, at vintage shows, you can always find something unique and a bit quirky. Yes, that burgundy hat is beautiful and memorable! Looks like a fabulous vintage event and lots of fun. Thanks for sharing with Visible Monday! I am vintagey. You look tres adorbs in those hats~! I adore all of your amazing hats! Hats are just so much fun. I really think they need to make a major comeback. Me too…now if I could just get up enough courage to wear them more often. Love the velvet hat with the bow. So glad you bought that, it looks great on you. Thanks. Wish I had somewhere to wear it. Yes, I'm a vintage loving gal also. I would absolutely love to attend this kind of event. You, my dear, are made for wearing vintage style hats. I do believe you best be donning that amazingly beautiful burgundy number quite often. Thanks for your kind comment, Trina. You gave me my first smile of the day. Clothes, especially vintage clothes, allow us to live multiple lives. It's what I love about fashion. Each one of your hats tells a story and brings obvious joy to your life (and to ours!). Thanks Marea. That's what I love about vintage too…the fact that each item has a past. I am the same when it comes to vintage jewelry, I love the earrings, the brooches. I do love hats! YOur are fabulous, I love all that you are showing, especially the plum one and its shape. I am a fan of 20s hats myself. Such fun! 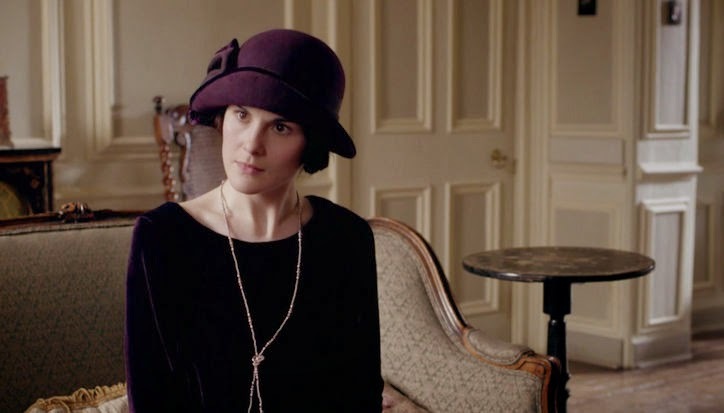 I love twenties hats as well…or anything about the twenties, actually. Thanks for stopping by. You wear your vintage hats so well. The joy for me of a vintage hat is to add a touch of history to a more modern outfit. I would wear the burgundy hat constantly , whatever the occasion . Keep collecting and enjoying your vintage treasures. Thanks Jill. And thanks for reading. Lovely read this morning. I adore your beautiful chapeau! 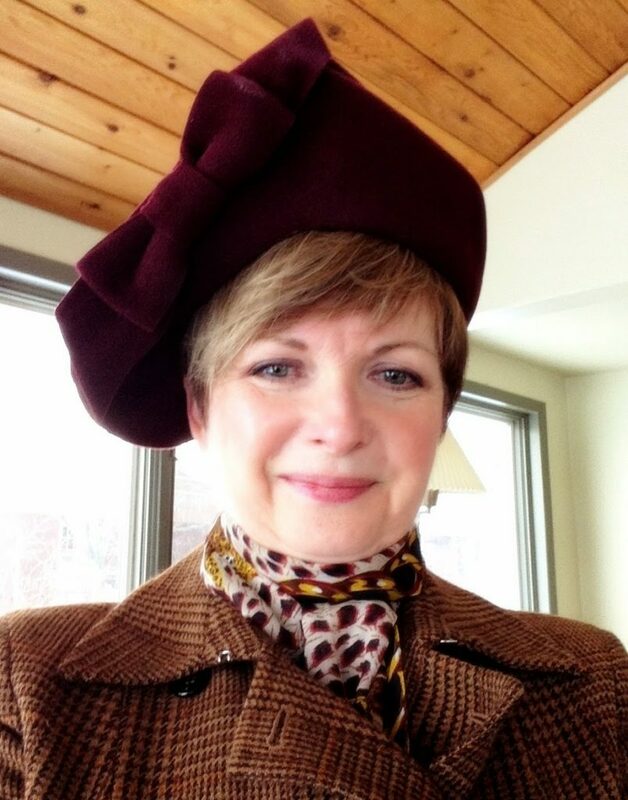 I think it is so fun to wear pretty hats in the fall and winter and am always on the lookout for a new one. Thanks. I must make myself wear them more. It's a shame that they just sit in my cupboard. I absolutely love you in all of these hats! That green fur trimmed coat is simply just lovely! This post with all its pics from the first to the last just made me gasp and swoon. I love things from the past too. I'm a sucker for art deco jewelry or a pin from another time. The hats are fabulous! Thanks Victoria…and thanks for the invite. Oh, very pretty … you in your vintage hats! Charming, completely. Your jewel and bangle collection is elegant as well, and I'm sorry you didn't get to the show. There's very little to be had here in MidNowhere. It's one of the nation's poorest areas, and with a very low population per square mile, not much is available. There are lots of antique furniture and "rusticana". 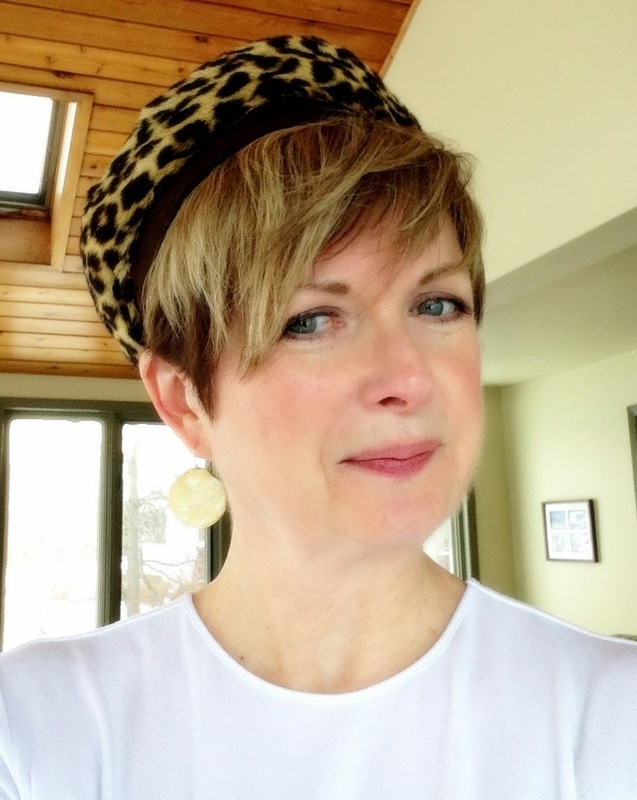 I was lucky to inherit my mother's and grandmother's jewelry, and I love the connection to the past there, as you do. I'm a costume-drama junkie as well, so I know what you mean.